I designed the poster with both of the genders in the same occupations with a different pay. The reason as to why I designed it, was because I wanted to emphasize the fact that companies will underpay women, for the same exact occupation in the same exact company. The reason why women are being paid less, even though it is against the law, is simply because of the injustice companies choose to go by and treat them unfairly. Overall, the poster was created to emphasize how society plays a huge role on how women are struggling at work based on the discrimination they face, especially regarding their income. First off, I want to emphasize the fact that even in the same occupation at work, women are treated unfairly. For this exact reason, the background of the poster consists of three different colors, pink, purple, and blue. The reason why I chose pink is because it represents women, while the color blue represents men, and the final color on the poster is purple because when you mix pink and blue, you get purple. On the top of the poster, the pink (women) is beginning but fades off, this is because women try to be on top in the work force but they fade off and are hidden with other things at work, which is the purple (company). On the bottom of the poster is the color blue (men), the reason why blue is on the bottom and not the top is because at work, companies try to hide off the gender discrimination between men and women. They often times make it seem as if men are not being favored and the company basically puts a protective coat on them. On a professional level, companies should follow the Equal Pay Act, where neither of the genders should receive an unreasonable increase of income. In the poster, there are two people, a woman and a man, representing both genders. The reason as to why both of them are wearing the similar attire is because in the work force, workers are not being seen as workers, instead, they are being judged by what is underneath. When you are looking at the two workers, their education, history, nor experience matter, especially if the worker has proven that they are qualified to perform very well. This is the point I try to make in the poster. They should just be seen as workers and not anything else, especially their gender, but instead, they are being labeled for the history behind their attire. In the same environment, there is no need to discriminate based on gender or other factors. 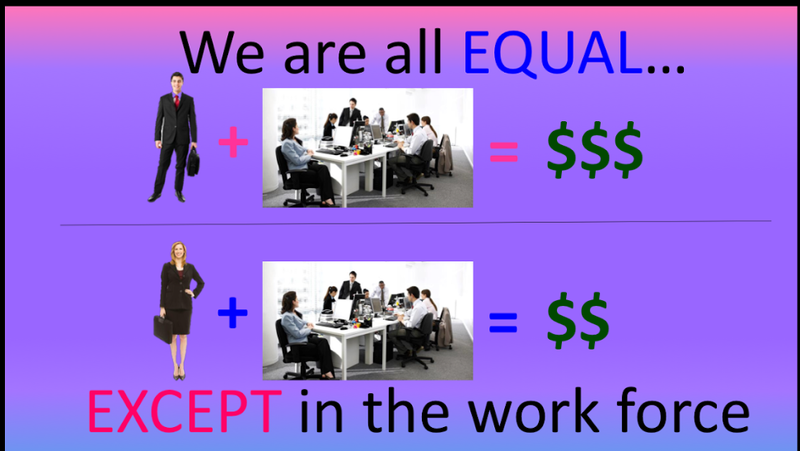 A key picture that I added was of the same office because the scenario of the inequality of work usually happens when both genders obtain the same occupation but are getting paid differently. Often times, the company manages to oversee the occupation and their production and just begin to treat their workers based on their gender. Your ability to perform well does not matter nor is it based on an individual’s gender, but companies are being blinded by it. They fail to realize that both genders can obtain the same occupation, meaning that they are producing the same outcome. Aside from the mistreatment, the biggest and most obvious factor comes when men are praised and receive a higher income, whereas women struggle to climb higher. When you put all the factors together in a simple equation, gender discrimination in pay is very noticeable.For men, they are making three figures, while women are making two figures, as presented in the poster. The income is an estimate, only to understand the bigger picture where in reality a male worker can be making $32,000, where as a female worker can barely be making $20,000, leaving about a $12,000 gap. There is no logical reason as to why there is a huge pay gap when both workers are producing the same job, based on the poster, but even then, the women are getting paid less, while men’s income is ridiculously higher. Everyone is fighting and stating that we are all equal everywhere, but in reality, a lot of the discrimination is seen in the work force. Which is why the final piece of the poster is the caption, “We are all EQUAL, EXCEPT in the work force.” The reason why I chose this caption is because people are fighting for equality. Women are not seen as anything close to men, regardless of their experience and education. They are not seen as workers, instead, in many cases, they are seen as a burden.